I'd have to admit that whilst reading this collection I had a break of some months between reading the first stories with that of finishing the book, but this did not detract from me being wholly absorbed with this collection. Initally I read the first two stories; The Comedy of Charleroi and A Living Dog Is Better Than A Dead Lion and then put the book aside distracted by other things and then picked it up again re-joining it again at Expedition to the Dardanelles, The Infantry Officer, The Deserter and finally End of A War. Drieu La Rochelle is probably most well know for his short novel Le Feu Follet which was adapted to film by Louis Malle in 1963, it has been translated into English as Will O' the Wisp, published by Calder and Boyars, and also by Knopf with the title The Fire Within, the price to get a copy now is pretty hefty, perhaps hopefully maybe one day there might appear a retranslation. Due to my rather fragmented reading rather that describing each of the stories in turn I can only offer a thematic description. Most of these are set in the First World War, some of the later ones, The Deserter and End Of A War appear to be set after WW1 but it's spectre and aftermath hang heavily over them and their characters. Whilst the narrators of these stories find themselves amidst facing the horrors of the warzone, they cast their vision out in to the modern war, comparisons are made between older notions of warfare with those of trench warfare, another impression with some of these narratives is that perhaps dialogues between the central narrator and other characters they encounter could be viewed as being Drieu La Rochelle's own ruminations with his own thoughts or viewpoints, perhaps discussing facets of viewpoints with his own alter ego, as in The Deserter and The Infantry Officer. As well as the war being the main focus Drieu La Rochelle expands the vision of his narratives in concerning a broader humanity, the prostitutes his characters meet, the overall tone is tinged with fatalism, which is none too surprising, and there is also a concern with the Europe of old contrasted with the Europe that will emerge in the aftermath, Drieu La Rochelle's stories capture the physicality of warfare, it's deserters, drunks, crippling futility, there are not too many instances that convey the bloodshed and horrors although one that stands out is of a young soldier who suffers a head wound that takes off the upper part of his face, although the narrator notes that the man turns his head as if he could still see in an attempt at finding his bearings, this one scene is enough to convey the occurrences in the back ground to these stories. 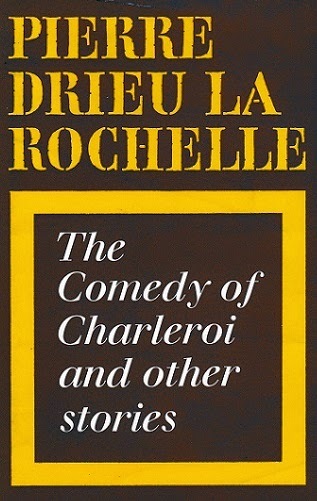 The collection is sadly out of print, Rivers Press also published Secret Journal and Other Writings, The Comedy of Charleroi and Other Stories is translated by Douglas Gallagher, from the original French published by Gallimard in 1934. That particular day I swore to myself that all that was a disgrace, an abomination, and that it had nothing to do with me, as a soldier. A soldier is a man. A man is a body. So what became of my body? I had no call to use it. My body was given up to some heavy, sneaking continual wound, hideous and slow, like some ghastly disease. There was no call for my body to run, to jump. There was no call for me to move my arms or legs. My muscles served no purpose whatsoever. As for the sense of command, that powerful part of my being between my body and soul, there was no call for that either. My men were sitting down, waiting. If there had been anything likely to rouse something in them, it would have been an active fear. And that absence of the enemy made all that was human in me completely lose all sense of direction - that is, it nullified the possibility of giving any meaning to my courage, it rendered anything I might do or say pointless, and paralysed within me all freedom to act.